Before telling you how to Start Your Mornings w/ a Quick, Relaxing & Lifting Coffee and Donuts Themed Beauty Routine we gotta go to that good ol' disclaimer: Housevegan.com is a participant in the Amazon Services LLC Associates Program, an affiliate advertising program designed to provide a means for sites to earn advertising fees by advertising and linking to Amazon.com. This post contains Amazon affiliate links. Good morning, friends! This month's Coffee Break with Hannah (see January's here) is a little wild. I'm incorporating it into this coffee themed post because I'll be real, this month has been almost 100% dedicated to moving. February has been all about packing and cleaning as we planned for an early to mid-March move. On February 14th (aw!) we closed on our condo, and soon after we found a sublet for our apartment - something we honestly didn't think was going to happen. All of the sudden instead of having a month to leisurely move, we had about a week. Oy! That's a happy "oy", but an "oy" nonetheless. So we've been very busy and I've had barely enough time to shower let alone pamper myself. Luckily I had previously created this Quick, Relaxing & Lifting Coffee and Donuts Themed Beauty Routine specifically to pamper myself on busy weekday mornings. Who knew these products would become my self-care staples this month? 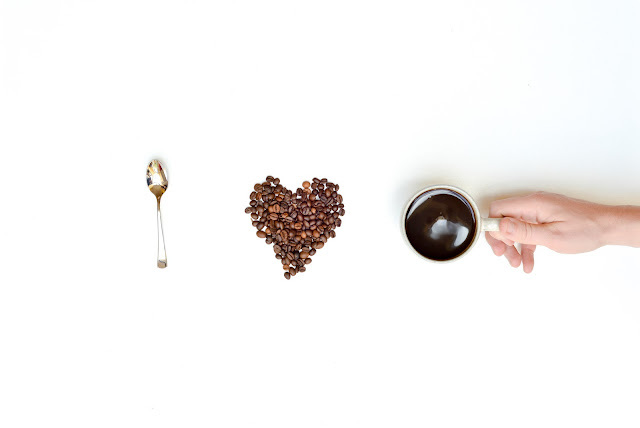 If you follow me on Facebook, you probably already know that I love coffee. I love coffee so much that I may actually be part coffee at this point. I started drinking coffee at the young age of 12, and it was such a special moment for me. The women in my family are rarely without a mug of coffee in hand, and graduating to my own mug felt like a rite of passage. Not anticipating a hectic move, this idea originally came to fruition because I needed to do something about my self-care routine. While I would prefer to reserve DIY spa days for lazy days, lazy days aren't really a thing right now. However, this kind of self-care is pretty important to me - not because I'm spoiled but because I'm old, and maybe a little vain. My skin doesn't bounce back the way it used to, mkay? I knew that the best time for me to pamper myself would be when I was already getting ready for the day. Efficiency! Because this was clearly going to be a morning routine, my mind immediately went to coffee. Coffee can take any moment and make it cozy yet invigorating, and these are the exact qualities that make it perfect for a DIY morning beauty routine. The first thing you need to do is make your products. You can get these done in an hour or less, and once you have them made they'll last for weeks. This is a good and relatively quick weekend project to do to set yourself up for Monday. This is the first whipped body wash I've ever made, and there were definitely things to learn here. That being said it was easy, cheap, bountiful, and used regular grocery store items. A win, win, win, win if you ask me! It smells exactly as described, and is reminiscent of those soy vanilla lattes that I used to inhale. I drink my coffee black now, and I doubt that I even like vanilla lattes anymore. However, no one can deny that they smell amazing. Side note - this doubles as an incredible shaving cream! For this scrub I decided to like, really truly learn from every other scrub I've ever made. First, I'm always a teensy bit enraged with the amount of oil left on my person and bathtub post-scrub so I gave this one an aloe base with just a small amount of oil to keep my skin from drying out. Problem so very solved. 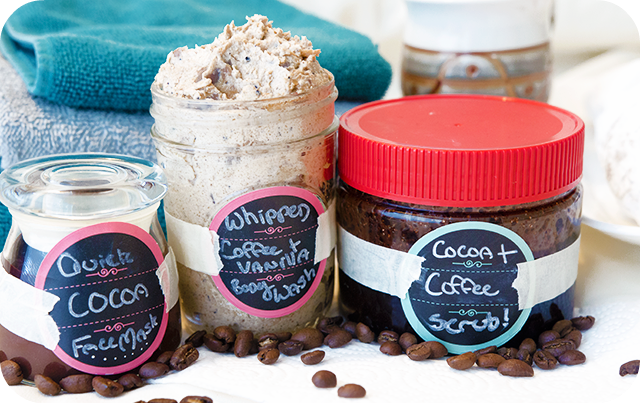 Second, coffee-based scrubs can smell really trashy without a complimentary scent. 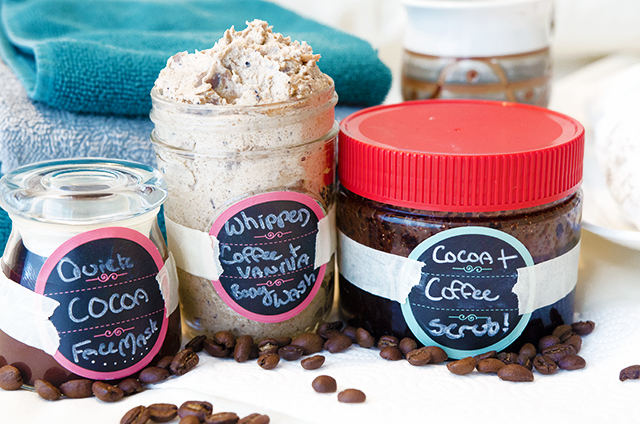 This scrub needed a boost to keep it smelling delicious, and chocolate was the natural go-to. If you can add coffee to chocolate to enhance its deliciousness, why not the other way around? 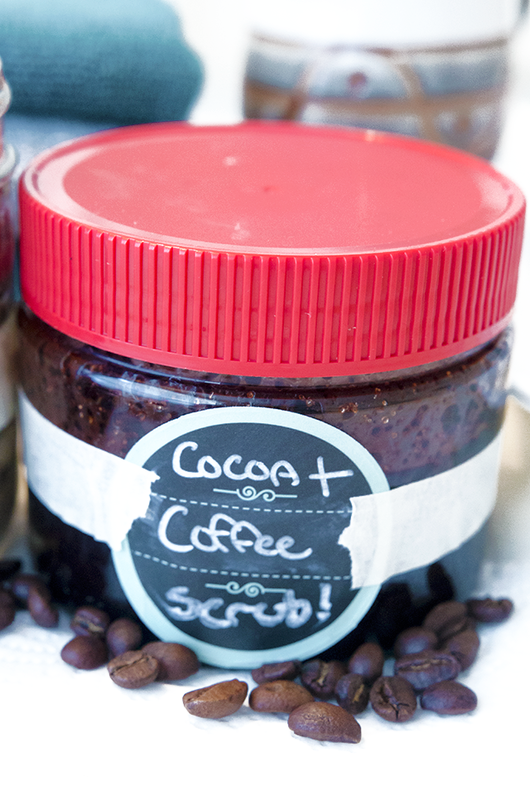 This Cocoa and Coffee Sugar Scrub smells very heavy of actual coffee, not coffee grounds, and will definitely enliven dull skin with each use. This mask is the quickest thing to whip up. I wanted it to be like chocolate donut glaze because I'm either gross or a genius. Either way, it worked! This mask not only smells like a chocolate donut, it'll wake up your face, gently exfoliate, and clean out your pores. I based it on my Revitalizing DIY Chocolate Face Mask which would be a good option if you're looking for something heavier. Ok, not a deep clean, but it's hard for me to feel relaxed or energized around clutter. I pick up my bathroom and give it a quick but thorough wipe down. This whole process only takes a couple of minutes, but makes a big difference. Our normal routine includes tofu scramble and toast, but if I'm going to want something special, I prep it the night before. 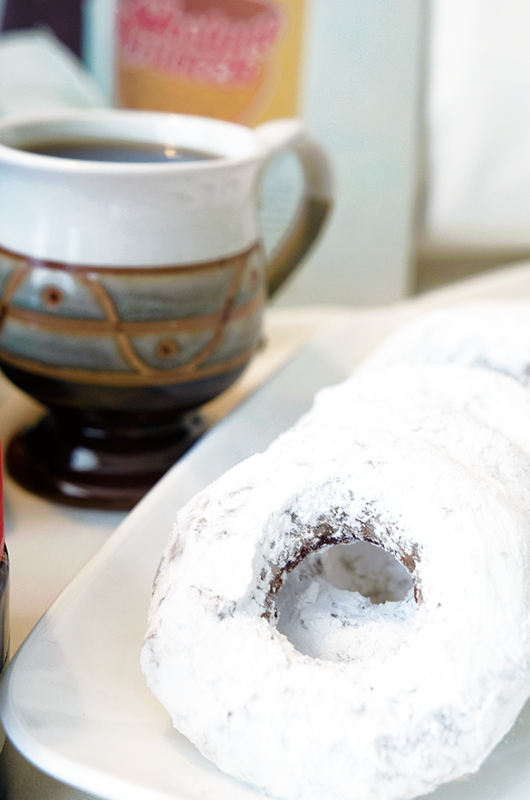 No one has time to make donuts or muffins on a Monday morning. Unless you're making a Blueberry Muffin in a Mug then ok, but you should still prep the batter ahead of time for maximum morning ease. Ours are these big fluffy orange towels that we've had for so long that I don't even remember where we got them. Yet they're still so fluffy. I don't want to waste precious pampering time trying to find the right playlist or album. I love Dave Brubeck's Greatest Hits, but that's me. 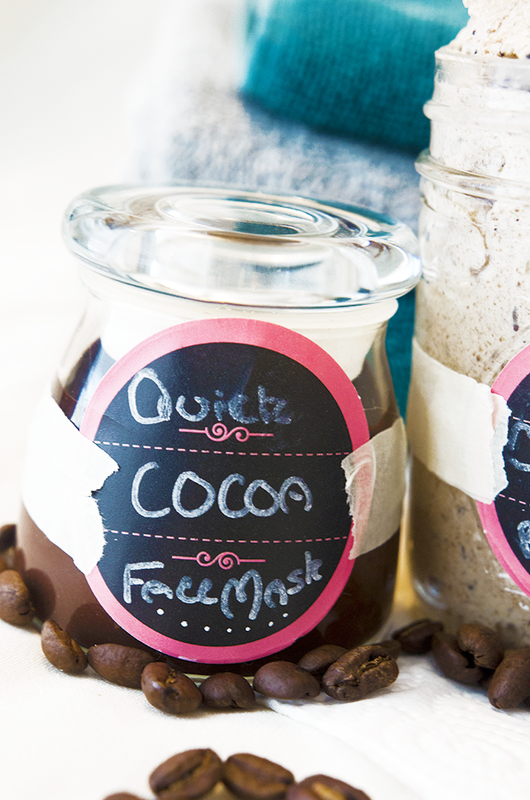 This beauty routine obviously comes with a cup of coffee on the side. I make sure my setup is ready to go. Step one: Apply the face mask. I need it to be on my face for 10 minutes, so I don't waste any time. Step two: Make a cup of coffee. I mean, duh. Step three: Put on my favorite morning music. This takes no time since I queued it up the night before. Step four: Get in the shower and immediately wash off the face mask. I do this first because I don't want chocolate running down my face while I wash my hair. It's gross, y'all. Step five: Pull out my Cocoa and Coffee Aloe Sugar Scrub and exfoliate. It can get pretty messy, but it isn't super oily thank goodness. Step six: Take a sip of coffee because obviously. Step seven: Scoop out about a tablespoon of Whipped Coffee and Vanilla Body Wash, work it into my loofah and wash, wash, wash, until I'm clean, clean, clean. Step eight: Finish my shower and follow up by moisturizing with something like cocoa butter, or Lush's coffee bean massage bar, Percup. Step nine: Keep the music going while I finish my hair and makeup, and get breakfast going. I'm usually ready for a second cup of coffee at this point too, let's face it. And that's it! With a little kitchen DIYing, and some simple prep, you too can have a luxurious coffee-filled shower any morning of the week. Happy Monday, friends! I've got my second cup of coffee in hand, Lee Morgan on the Jambox, and my skin feels amazing. Such a good way to start the week in our brand new home. 1. 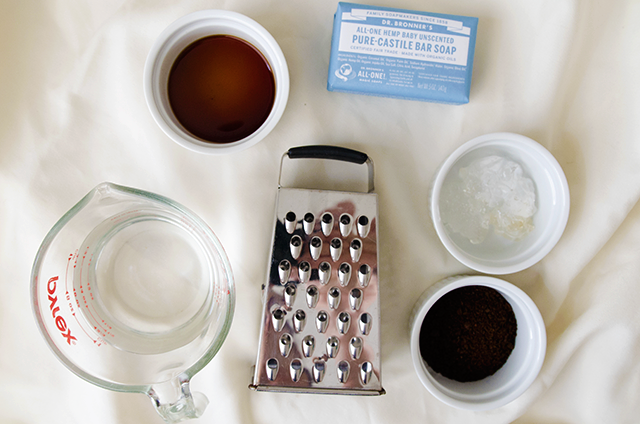 Combine the grated soap, water, coffee and vanilla in a medium-sized pot over medium heat. Whisk continually until melted and starting to bubble. Remove from the heat and continue to whisk for 2 minutes. 2. Strain the mixture over a bowl, saving the soapy liquid and discarding the rest. 3. Add aloe vera gel to the soapy liquid, and transfer the mixture to your blender. Blend until any chunks are completely broken down. Alternatively, you can use an immersion blender. 4. Place the mixture in the fridge to solidify. 5. Once solidified, scoop the soap mixture into your stand mixer and whip it using the whip attachment until the soap is light and airy. You'll need to regularly wipe down the sides of the bowl to achieve this. 6. 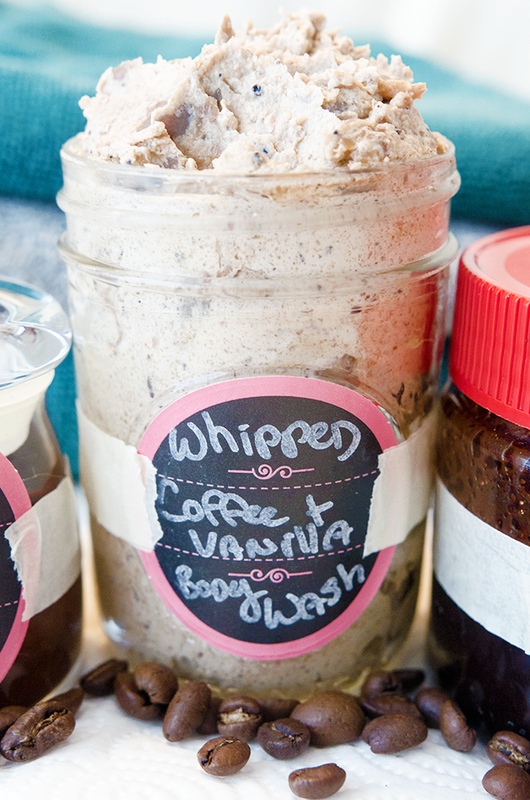 Transfer the whipped body wash to an airtight container and use as needed. 1. In a large bowl, mix all of the ingredients together with a flexible spatula. Store the finished scrub in an airtight container. 1. In a small mixing bowl combine the cocoa powder, oat flour, corn starch, spearmint, and baking soda. 2. Add the water, and stir to combine.